On a chilly Friday night, half a dozen members of the nonprofit Legacy Initiative are patrolling the mean streets of Salt Lake City. Decked out with walkie-talkies and conspicuous neon-green vests, the group of cheerful volunteers resembles at first glance a laser-tag team that took a wrong turn off the playing field and ended up in the bad part of town. “What are y’all supposed to be? Power Rangers or Ghostbusters or both?” a pedestrian asks as the group finishes crossing the road, moving away from The Road Home homeless shelter at 235 S. Rio Grande. “We’re kind of an advanced neighborhood watch,” says Travis Hysell, the leader of the group. Since July 2012, the group has taken a face-to-face approach to homeless outreach, filling up backpacks with burritos and bottles of water to give directly to the homeless. Alarmed by recent accounts of rising crime near Pioneer Park (300 South & 300 West) and areas near the homeless shelters, the group has begun doing monthly night patrols, which they spend distributing fliers, granola bars, and bottles of water and Gatorade to the homeless. They also keep an eye out for criminal activity and scour empty lots and alleys, looking for dirty needles to destroy. But one of the most important tasks for the patrol is building support for an affordable housing project, which the group is calling the Legacy Village. The design is based on models including the Dignity Village in Portland, Ore., where residents live in shed-like structures and govern themselves based on rules of living free of illicit substances. The city there eased ordinances to allow the village to operate like a campsite; residents pay minimal monthly dues to cover running water and electricity. The Legacy Initiative is in the early stages of advocating for the donation of a plot of land in Salt Lake City where living structures could be erected for the homeless to live in cheaply and maintain as a cooperative. On Sept. 30, Salt Lake City Mayor Ralph Becker held a press conference announcing plans to both combat serious crime in the area and assist the homeless in getting back on their feet through a “holistic” approach driven by a new Salt Lake Solutions team of stakeholders. Karen Hale, a spokeswoman for the mayor’s office, says the administration’s new efforts include a remodel of the 500 West median to reduce crime and renewed efforts at policing and programming. They’ve even hired a full-time staffer to interface with different stakeholders and have partnered with groups like the Downtown Alliance to hire formerly homeless individuals to do cleaning and landscaping in the shelter area. Hale says that the city has seen conflicting research on the effectiveness of housing like the Dignity Village, but says that the administration is open to learning more and making new partnerships. “It’s going to take help from all different segments of our population to address this issue,” Hale says. Hysell and others behind Legacy Initiative realize that their plan will require support from city leaders, as well as leaders from the homeless community. But while the mayor’s committee works with traditional players, the Legacy Initiative continues its networking through other nonprofit innovators, like David Brooks of Revolution United and Jeff White, who designs affordable housing from salvaged shipping containers. Hysell sees potential in a two-phase cooperative housing situation: The first phase would make single-structure housing available to the homeless and low-income, and the second phase could include office space for local service providers and nonprofits. “We’ve got some really cool people doing really cool things; the problem is that not everyone’s working together,” Hysell says. Salt Lake City Councilman Kyle LaMalfa has met with the Legacy Initiative and is encouraged by the group’s goals and energy, especially in performing the evening patrols. “They aren’t counting on someone else to solve the problem, they are owning it,” LaMalfa says. A City Weekly reporter followed the merry band of volunteers until 1 a.m. one evening as they made a circuit throughout the city, hitting homeless hangouts from Library Square to Granary Row, as well as lesser-known spots like “poo alley”—a small campsite, narrow as a city sidewalk, that abuts the 400 South onramp and earned its name from volunteers for obvious reasons. 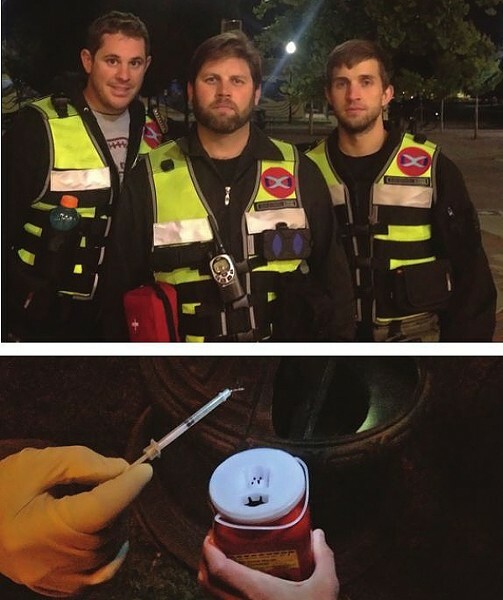 Even there, where the smell is like a suckerpunch to the nose, the group stops to make sure a woman wrapped in a blanket is responsive and well and to look for any drug paraphernalia they can clean up. The group carries a GPS tracker and uses it to mark homeless camps for future outreach and also to mark spots where they find needles, so that they can share information about drug activity with law enforcement. While the group walks through neighborhoods many Salt Lakers won’t drive through, they remain upbeat and cheerful, killing time with discussions ranging from plans for the village to an ongoing debate about what their patrol’s theme song should be (the evening City Weekly shadowed the patrol, the theme song to Beverly Hills Cop was a strong contender). The group is serious, however, when it comes to being careful around drug dealers and also being on the lookout for those in need. Walking along Rio Grande close to midnight, the patrol comes upon a young man with his arms tucked into a dirty sweater passed out across the curb, nestled between parked cars at the dark end of the street. After giving him some water and a space blanket, the patrol calls in an ambulance and waits until the unresponsive man is safely loaded onto a stretcher and taken to the hospital. Calling for ambulances has become a regular occurrence for the patrols, Hysell says. After the man has been taken away, Hysell continues down the road, speaking to more homeless residents, looking for contacts to help make the village idea a reality. For LaMalfa, something like a Dignity Village is still a long ways out, but he hopes the city can support the group in any way it can.